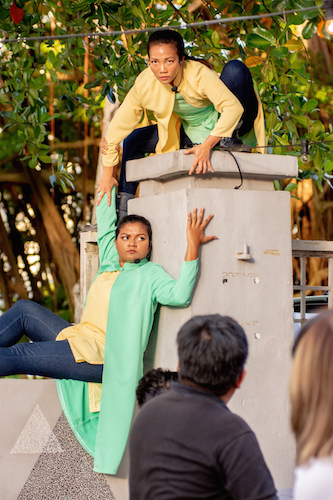 We move through the Kampong Bugis landscape throughout the performance, along patches of grass, the river, and brick-tiled pavements. A residue of dirt, sand, and mud clings to our soles, and the afternoon is afflicted with bouts of rain. The atmosphere invokes a stifling sensation brought upon by the weightiness of humidity, which bears down on us as evening approaches and we lose the last few rays of sunshine. BITTEN: return to our roots by Thong Pei Qin & Dr. Nidya Shanthini Manokara, ran on 24 and 25 November, and 1 and 2 December. 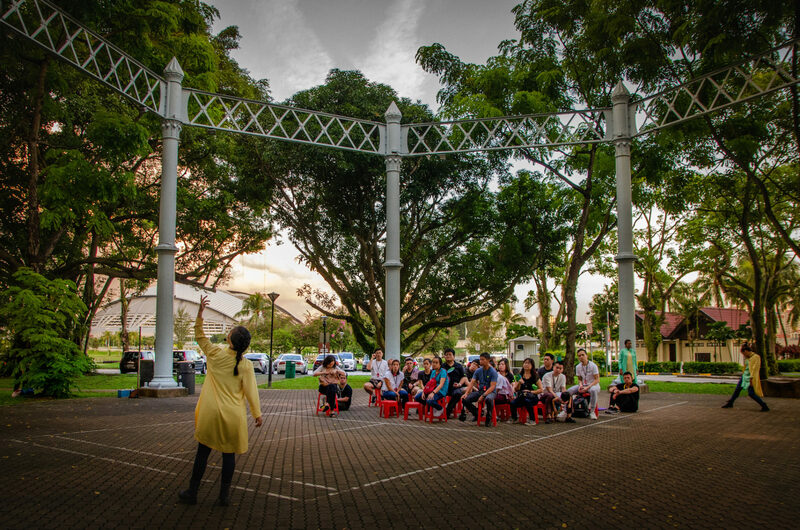 The performance brings one on a walking tour of the Former Kallang Gasworks and its surrounding areas, beginning at hip barbecue spot Camp Kilo Charcoal Club and ending at the Sri Manmatha Karuneshvarar Temple, a five-minute walk away. The sensorial shape of the narrative is presented to us by performers Masturah Oli and Seong Hui Xuan, whose characters – Yamuna Devi Chathrapathi and Dong Xi Yan – are united by a mutual bout of dengue fever. This sets the scene for a collaborative exploration of their history due to their similarities, and begins the interrogation of their respective pasts and how that has influenced their present. Intertwined with their interrogation is the notion that spaces occupy multiple identities, for both characters, and for the audience members, who are encouraged to map upon its history with their own experiences. Together, they imply that it is within those experiences, carried from the past, that we are able to discover who we are. We come close to a small bridge going over the Rochor River. The river is coursing due to the heavy downpour, and its ambient flow blends with the music emanating from our personal headsets. The result is at once disorienting and illuminating. Within this segment is perhaps the most affective sound of the work. That sound is the soft jangle of the bangles on the arms and ankles of researcher and choreographer Dr. Nidya Shanthiri Manokara. Masturah Oli speaks as a fictional version of, and thereby on behalf of, Dr. Manokara: narrating the story of how she came to be introduced to bharatanatyam, and what it came to represent to her. Just as the bangles strike against one another to produce a resonant sound, the auditory and textual mix to create a coherent whole. Dr. Manokara’s magnetic presence, a fragment of the environment, embodies Yamuna’s fascination with the dance, and physically showcases the beauty of the form. 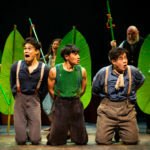 Throughout the journey, our soundscape fizzles depending on how close or far we are from the stage manager carrying the radio transmitter, and music is overlaid atop the text. While there are moments where the elements are complementary, there too are times where my senses feel inundated. Heat and flames used to disrupt the clouds. The transformed location used to be known as “huay sia”, 火城 or “fire city”. That location is none other than the Kallang Gasworks, a site built to manufacture gas for street lighting. We arrive at a monument of Kallang Gasworks Holder No. 3, where the four performers come together. A large-format photograph of Dong Xi Yan’s grandfather looks over the audience, as Dr. Manokara and dancer Rachel Lum continue their respective choreographies. We are seated in the centre of where a towering circular pipe of flame once stood, and are treated to one of the more memorable, invigorating, and passionate segments of the piece, where Yamuna questions the art and evolution of bharatanatyam. The same form that has given her respite, pleasure, enjoyment and suffering from a young age, is revealed to have a dark past. One that is brought over to Singapore, traversing multitudinous and chaotic waves and seas, on a ship (symbolised by a small paper boat floating down a longkang). That dark past is facilitated and caused by colonialisation: which has deemed the original form of bharatanatyam as too sensual, too immoral, too out-of-line with Western conventions. The form was banned, and though it was later revived, elements and characteristics of the form were irreparably changed, replacing flexibility and sensuousness for a more fixed, angular choreography. Here, free from the headset, the words echo around the imagined chamber of the Gasworks’ holder. 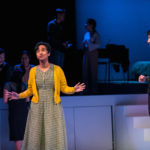 Oli’s powerful monologue, and Dr. Manokara’s solo performance hammer home the same point: that what we inherit is never easy to negotiate, but we do so with the desire to mould the forms so they can make new meanings for us. We move further on to a small clearing, where we see performer Rachel Lum executing a complex choreography reflecting Dong Xi Yan’s confusion with her cultural history, and the linguistic differences between herself and her father. In midst of all this are several small paper boats, placed strategically in a circle, as though to hint at attempts at keeping afloat in spite of overwhelming cultural rifts between Xi Yan and her history, which seem to be growing wider. 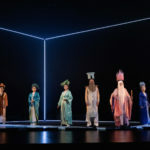 The theatre-centric, euro-educated, “rojak”-like Xi Yan feels a palpable disconnect with her roots, and the solution offered is revealed to be the tour itself. The tour we are on mirrors the tours Xi Yan’s father used to lead around the area, which shed light on her grandfather, whom she never really knew. This tour acts as a mechanism through which she negotiates her identity, expressing through art the developments in the relationship she has with her past. As we meander through the area, we follow the curve of the river and the drains and canals around it, just as Xi Yan traces the winding trajectory of her own self-discovery. We arrive at Sri Manmatha Karuneshvarar Temple, the last stop on our tour. Before we enter, our feet are washed by a crew member. Subsequently, Xi Yan and Yamuna tell the story of Kamadeva, the God of Love. A great demon was terrorizing the land, and none could defeat it but Shiva. Unfortunately, Shiva was in deep meditation, and could not be woken. Kamadeva decided to enter Shiva’s abode and attempt to wake him up by shooting him with one of his arrows. Shiva woke, but in his fury and anger, incinerated Kamadeva on the spot. Kamadeva’s wife pleaded with Shiva to be allowed to join Kamadeva, and her desire was eventually granted, albeit with certain conditions. The hypnotic flames that are found in the candles around the temple are temporally intertwined with the Gasworks’ tower of flame, which prompted its workers to create the temple as a place of worship for the Hindu employees. The sensory experience of the walking tour feels like a kind of fever dream, not unlike the mutual experience that first united Xi Yan and Yamuna. As we sit down inside the temple, we are given folded paper boats, the same ones that litter the spaces we have visited. The small boat I held in my hands seemed to prompt me to think about the narratives I carry within myself. How were they similar or different from those of Xi Yan or Yamuna? How strong are the ties I have to my own history? I had no answers, but I appreciated the questions. I found myself agreeing more and more with Seong’s implication that we are all “rojak”. We are all complex beings, with our own histories, our own perspectives, and our own disparate experiences that constitute our personalities. What the performance iterates is that the greatest act of reconciliation, the most effective remedy to alienation, is a collective participation in each others’ experiences, so as to share the burden of our varied pasts. BITTEN: return to our roots by Dr Nidya Shanthini Manokara and Thong Pei Qin was staged at Camp Kilo Charcoal Lounge on 24-25 November and 1-2 December. This response is based on the performance on 1 December 2018, 6pm.